All wind farms operating today in Poland will be scrapped by 2035, with no new turbines built to replace them, stipulates draft “Energy Policy of Poland until 2040” presented by Ministry of Energy on Friday. This is a political decision, the Minister explained. On Wednesday the government contracted with investors the construction of several hundred new wind turbines (with a capacity of approximately 1 GW). The average prices offered by investors, at which they committed to sell electricity, barely reached 197 PLN/MWh. This is less than the current market price (250 PLN/MWh) and much less that the total production cost in new coal-fired power plants (350 PLN/MWh). 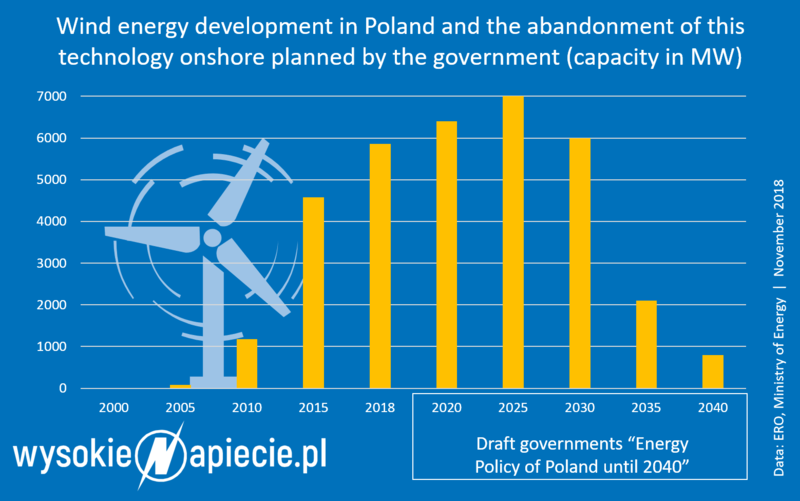 However, on Friday Ministry of Energy presented the draft Energy Policy of Poland, which reads that all existing wind turbines will be scrapped by 2035, with the ones just contracted by the government a few years later. No new wind farms will be built to replace them. Interestingly, the Ministry is planning the last auction for wind to be held next year. The Minister’s statements indicate that approximately 1.5 GW of capacity may be contracted. However, when aged, the turbines are to be irrevocably removed from the landscape, and the improved sites are to be used for whatever other purposes. Where Western Europe invested for years in the technology to drive the costs down and replace the old turbines with state-of-the art next generation machines, Poland is the only country on the continent that announced complete elimination of the technology and scrapping of the entire infrastructure left after the decommissioned turbines. 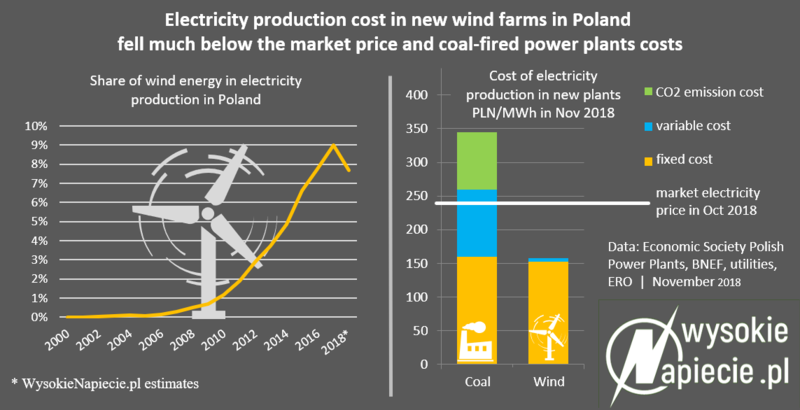 “The decrease in production from wind turbines is forced by our political commitments,” explained Minister for Energy, Krzysztof Tchórzewski, who presented the draft “Energy Policy of Poland until 2040”. The commitments he mentions are the political promises made by some Law and Justice MPs. In particular, the objection of the Lower Silesian Law and Justice MP and Minster for Education, Anna Zalewska, played an important role. When in opposition, she informally represented the voice of organisations opposing to the construction of wind turbines in the vicinity of their places of residence. A study by the Polish Academy of Sciences demonstrates that although less than 2 percent of all wind turbines in Poland is installed in the Lower Silesia region, 9 out of 102 social conflicts related to the construction of wind farms identified by PAS (which in total covered 4 percent of municipalities in the country) occurred in the region represented by MP Zalewska. Minister Zalewska also appeared during rallies opposing the investments together with attorney-at-law Marcin Przychodzki, the founder of the “Stop Wiatrakom” (“Stop the Wind Farms”) web portal, currently Director of the Ministry’s of Infrastructure Legal Department, which with good effect requested implementation of regulations applying higher tax to wind farms as compared to, for instance, coal-fired power plants. The portal itself commented the Wednesday’s auction results as “making fool of the people by the Morawiecki’s government”, and is long criticising the Ministry’s of Energy and the Prime Minister’s actions in that area, at the same time calling for PolExit. Eventually the Parliament, under pressure from the European Commission, withdrawn from the discriminating tax regulations in June; however, the decision left on their own the municipalities which, despite warnings, took advantage of the unclear regulations and imposed higher taxes, and are now obliged to return it. So far the dispute within the government has been won by Anna Zalewska. This is because another provision she lobbied for remains effective. There is a ban on the construction of wind turbines at a distance less than tenfold their tip height. The “10 H” rule de facto means that only the 1990s-sized turbines may be built in Poland. Modern, tall wind turbines could be built only on farmland with no residential houses within 2 km, which is almost impossible in Poland. 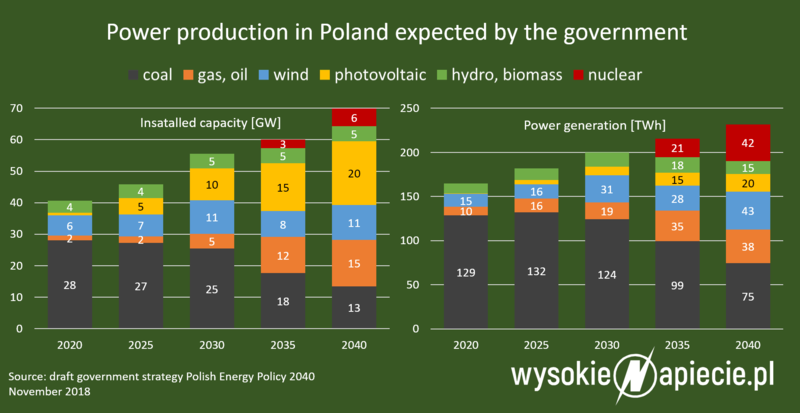 See also: Can capacity market really help Polish coal power plants to survive? In accordance with Minister Krzysztof Tchórzewski the regulation is to completely eliminate the possibility to build new wind farms when the still-existing building permits expire. The Ministry of Energy wants to fill the market gap caused by the decommissioned wind farms with more expensive offshore wind farms, which lead to protests only from fishermen. “The practice demonstrates that onshore wind turbines are available only 20 percent of the time, whereas offshore this is 40-45 percent,” Minster Krzysztof Tchórzewski explained on Friday. The Minister’s rationale leads to doubts as to the validity of the Ministry’s of Energy knowledge, which prepared the draft Energy Policy of Poland. Capacity factor at the level of 20 percent was typical of wind turbines marketed 15 years ago. Last year wind turbines in Poland operated above 10 percent of their installed capacity for 77 percent of hours during the year. The average capacity factor amounted to 28 percent. The figure was contributed to by the oldest turbines, mentioned by the Minister, as well as the more modern machines, which on average achieve 30-35 of installed capacity. The latest wind turbines could operate in Poland with the average capacity factor of 45-50 percent, which – in accordance with the not entirely up to date Minister Tchórzewski’s knowledge – is achievable only in the Baltic Sea. However, such onshore wind turbines can no longer be built in Poland due to the legal limitations mentioned above. Electricity production cost in such installations could reach approximately 150 PLN/MWh. According to the draft government strategy by 2035, onshore wind energy will be replaced by offshore.